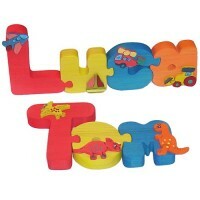 At Hometime Crafts we specialise in personalised wooden toys and personalised wooden gifts. Browse through our website and you will find many educational toys and wooden products designed and made by us along with other quality products, most of which can be personalised in the name of your choice. We can also add a keepsake message to some of our products which makes them ideal gifts for a Christening, naming ceremony or any special occasion. Some of the products are unique to our website and include:- name jigsaws, children's chairs, children's stools, nursery clocks, name hangers, door plaques, money boxes, bookends, etc. Other products include items such as educational jigsaws, wheeled toys, activity toys and lots more. This traditional solid oak child's captains chair is our heaviest and widest chair and is a great keepsake gift. The chairs are delivered fully assembled and are given a hand waxed beeswax finish to enhance the beauty of the grain. The chair is available in a range of designs for girls and boys, its also available with no design. See the 'Design' drop down box for our full range of designs and pri.. These chunky free standing wooden jigsaws are decorated with wooden cut outs in either a Jungle, Space, Dinosaur or Vehicle theme. The jigsaw is finished in brightly coloured stains. Not only a great decorative feature but also a fun way for a child to learn how to spell his name. Names are priced £1.70 per letter, please ensure that the name required corresponds with the number of letters o.. 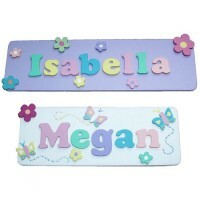 Pastel coloured rectangular name plaques for bedroom doors, playroom doors, etc. All plaques are provided with either double sided sticky pads or decorative ribbon as shown in the option box. The sticky pads are best for doors and the ribbon for hanging from anywhere in the bedroom or nursery e.g. door handles, beds, etc. These plaques are available in several colours and designs to..